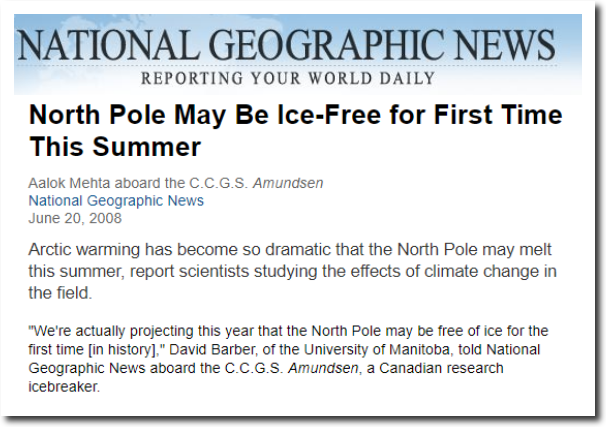 Ten years ago, I wrote my first article exposing the melting Arctic scam. The scam is on its last legs. Very cold, northerly winds east of Greenland are driving sea ice extent graphs nearly vertical. This will become particularly problematic for climate fraudsters like Jennifer Francis and Michael Mann, who have been blaming the Polar Vortex on missing sea ice. 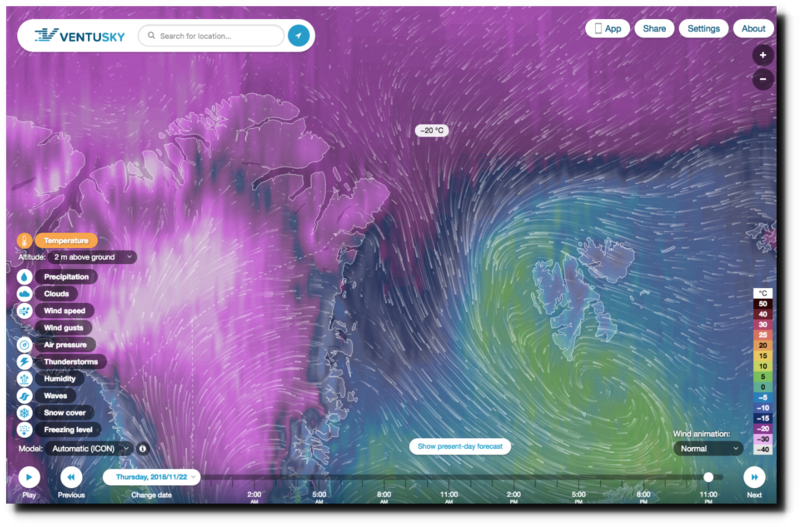 And so the Arctic will leave the headlines for awhile and global warming will move elsewhere. Alaska will be on the slate since next month a ridge brining unseasonably warm temperatures there is likely to form next month. It will be one of those times when temperatures here in Indiana and to the NE will be colder than they are in Alaska. the scam never ends. It just changes the place it focuses on. Actually during the last ice age the interior of Alaska was ice free according to the University of Fairbanks. Yes it was but that was over 12,000 years ago and the alarmist conception is that the world and it’s climate started in 1979. I tried to inform a friend of a friend about that, and he replied that it was only the Brooks Range had blocked incoming storms. I suppose any excuse will do. 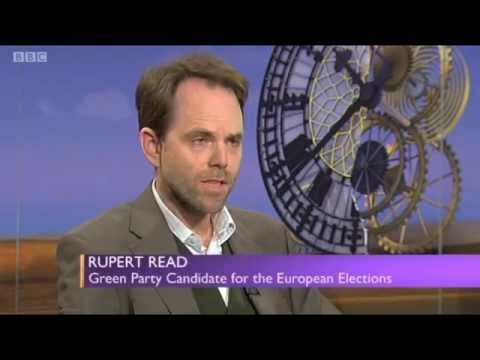 Although their publicly funded, pal-reviewed pseudoscience is imploding, the MSM have been silent for over a decade, and instead, they keep propping it up – still pumping out the Party Line of AGW (Climate Change ™) hysteria. But, they have a lot in their disfavor. First, the Sun is spotless; it is not cooperating with their CO2-is-to-blame hyped-pothesis. On top of that, the very natural cycle that allowed the scam to flourish in the first place will reverse course sometime over the next decade, or so. So, this “tipping point” fraud is at a tipping point itself. When the Atlantic Multidecadal Oscillation naturally changes course, this Titanic [CO2-caused-it-and-warming-is-unstoppable-without-carbon-taxes-and-windmills] fascist scam will go down to the bottom very fast. Naturally. The Jim Joneses at the top of this fraud know that their gravy train is barrelling toward a granite wall – and they know that there is nothing they can do now but keep up the Big Lie and keep pushing for their larger, global government panacea until impact. Their deceived sheep [I used to be one] are completely unaware. The definition of ‘climate’ adopted by the World Meteorological Organisation is the average of a particular weather parameter over 30 years. It was introduced at the 1934 Wiesbaden conference of the International Meteorological Organisation (WMO’s precursor) because data sets were only held to be reliable after 1900, so 1901 – 1930 was used as an initial basis for assessing climate. It has a certain arbitrariness, it could have been 25 years. For its recent 1.5°C report the IPCC has changed the definition of climate to what has been loosely called “the climate we are in.” It still uses 30 years for its estimate of global warming and hence climate – but now it is the 30 years centred on the present. Global warming is now defined by the IPCC as a speculative 30-year global average temperature that is based, on one hand, on the observed global temperature data from the past 15 years and, on the other hand, on assumed global temperatures for the next 15 years. This proposition was put before the recent IPCC meeting at Incheon, in the Republic of Korea and agreed as a reasonable thing to do to better communicate climate trends. Astonishingly, this new IPCC definition mixes real and empirical data with non-exiting and speculative data and simply assumes that a short-term 15-year trend won’t change for another 15 years in the future. they will always get the results they want. They should also be paid that way. the other half of the money they will receive in 15 years,depending on how good their models worked from 2018-2033. Anon, Thanks for that article. Gotta give ’em props for how desperately they want to keep the Titanic on course. But it is still barrelling toward that proverbial wall out in the middle of the Atlantic. At some point within the next 15 years, the AMO will drop below the median and begin in its ~35-year colder-than-average half of the cycle. After following this subject since McIntyre/ McKitrick showed the flagrant abuse of science and statistics by the dendro community, the egregious manipulations of activist “scientists” no longer astonishes. For me, now it is good unbiased science that astonishes. Yep. It’s not surprising so many young people buy into it – they’re still thinking they can “change the world”, a world they’ve been told will vanish without their help. But the pathetic part is that so many otherwise reasonably intelligent grown-ups accept the myth of “global warming”. That’s scary. And, for sea ice volume on November 22: DMI reports 14,414 cu km, 99.1% of the 16-year reporting period average for the day. Thanks Anon, now I know how to get my answers. Hahahaha I wish I have a headache over it now. The new Scam is the Sun Spots are appearing and the sun is going dormant for awhile this year. We’re starting a mini ice age yep a mini ice age! Mean while the reactors a Fukushima are spewing radiation everywhere and into our oceans, selling contaminated food to Americans. I bet most of them will get cancer who eat that food. And Most of California is contaminated with nuclear fallout ! And nobody cares! All the beaches are covered with nuclear fallout, most fish are contaminated, what to the libs to rasied the legal amount you can safely eat! Truth is none of it is good for you! You got something wrong there… The Sun is not getting more Sun spots… it’s getting fewer. Do some research.. many scientific institutes and College research groups have published articles about this. You’re correct. As an amateur radio operator, I’m acutely aware of the current abysmal RF propagation now, based on the low sun spot rate. Your tin foil hat is leaking, Melkin !! Most of California is contaminated by socialism and leftism. What are you drinking Mark? The Nuclear fallout hasn’t done much beyond a few dozen miles from the shore, you are showing how little you think, because that small fallout into a massive water basin will be well diluted in a short time. No the state of California is not endangered by what happened in Japan, stop being pulled by the nose over stupid ecoloonie claims! Any way one cuts it, building a nuclear facility on the ring of fire or any area with elevated seismic activity is not a good idea. The ring of fire seems to be getting more active. There were 65 significant volcanic eruptions along the ring of fire during the entire 20th century. In the first 18 years of this century there have already been 25. Unfortunately there will be more to come and whatever is triggering these crazy weather patterns pretty much world wide, has also been triggering an increase in earthquake activities as well as volcanic eruptions. After checking various historic accounts, my hunch is that once again we may be looking at a repetition or anniversary of the 3600 signature cycle which last time triggered the Ten Plagues (1500 B.C. )(1500 + 2018=3518 approx.) and drove the then Pharaoh nuts and resulted in the release of the Jews from captivity and became known as the Exodus. The catch is that these plagues in some form or another were not just limited to ancient Egypt but from some not easily obtainable records we find that ancient China had suffered from them as well. If this is the case and will materialize all we can hope for is that this cycle will be less destructive. Aside from that I believe that Global Warming will be the least of our problem. Weather Manipulation! Global warming is a great cover story. https://www.youtube.com/watch?v=ZmqqRF9lkfw Mark Levin and Patrick J. The vote for leftist is NOT collapsing. Which is the greatest global scare that allows all other scares. You can thank public education for the liberal brainwashing of students. their voting results are a joke. They would lose every election by 20:80 if the system was unrigged. The arctic ice scenario –and global warming — is a political vehicle to advance one-world government. That’s OK. James Hansen has himself covered and will just revert back to claiming an ice age is coming like he claimed in the 70s. The chumps will continue to believe him and he will say, “See, I was right all along.” Then he will go on to claim how all the BS and costs we are incurring because of the global warming/climate change scam needs to continue because that will also prevent the coming ice age from happening. al gore got rich off it ! and THAT !!! is a fact !!! Rich-er… his family was already rich. How did they get rich? Bituminous coal mining. Once they made their stack off of the exploitation of natural resources, they decided that nobody else should have the same chance. He’s a perfect poster boy for the scam. Don’t forget all the money the Gore family made from growing and selling tobacco. Even while Al was preaching against smoking, he and his family were still bringing in all that sweet Tennessee tobacco profit. Of course not just anyone can legally grow tobacco. You have to be in possession of a special governmentally granted license — which his politically well connected family just happened to have. Calling him a thieving hypocrite is a slur against thieving hypocrites everywhere. A Common Truth: Just like with people when you torture numbers long enough, you get the answers you want! The sad thing is that there are millions of gullible sycophants unwilling to temper their beliefs with facts. I can understand their initial perception, since there is a strong effort to subvert science; like many times in the past. Unfortunately, false beliefs lead to societal extremism, and some become violent. Their efforts become as backwards as those wanting to rid the world of dangerous witches. Come on. Seriously? The graph is only showing data from the last 37 years. And it’s still showing a ~30% reduction in sea ice this year. Calling someone a fraudster in an article about science is a pretty good indication that you’re full of s.
8 paragraph articles from websites that look like their next publication will be about how evolution isn’t real. Cherry picking data about sea ice extent during a cold front isn’t a convincing way to go about an argument. What about all the glaciers receding around the world? What about plants surviving in habitats they didn’t 50 years ago? What about plagues killing wildlife in Siberia because 1000s years old permafrost is melting and exposing diseases? What about coral reefs bleaching because the oceans are warming? Your mindless hysteria is noted. You need deprogramming. You have mindlessly bought into alarmist hype, and don’t even realize you are presenting cherry picked scenarios, right after you accused Tony of cherry picking. When you can present a coherent comment, please do. How did the pathogens causing the diseases you claim get buried in the permafrost in the first place? Could it have been because it was warmer at some previous time long due to natural variation before the industrial revolution or even the use of fossil fuels. Na! That couldn’t be the reason now could it? LOL! I could go through and poke big holes in the rest of hysterical rantings but why bother since you aren’t even smart enough to have figured out what I just pointed out for you on your own. Hey Prof Stev! Just a polite question for you… Are you really a professor? If so, what field are you a professor in? 2. – a person who affirms a faith in or allegiance to something. 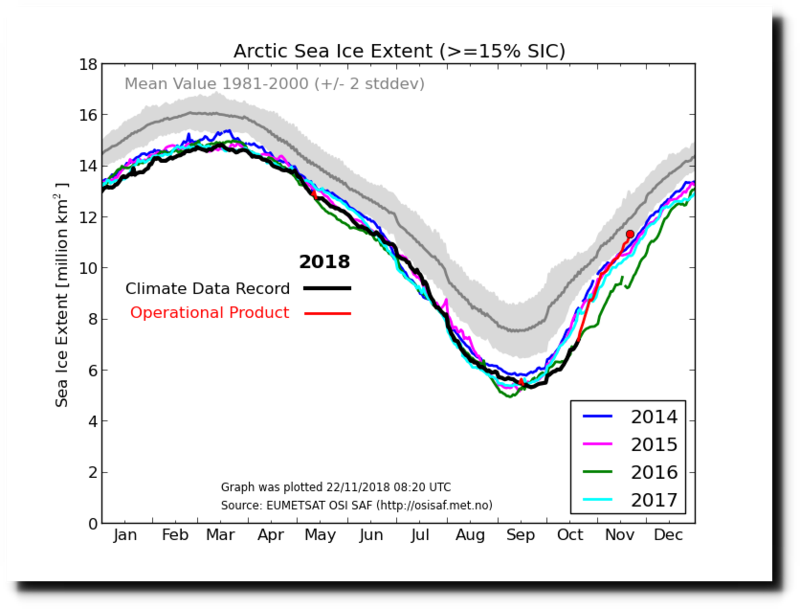 How’s that overdue ice-free Arctic looking, Prof? Richard S. Lindzen: Alfred P. Sloan Professor of Meteorology at the Massachusetts Institute of Technology and lead author of Chapter 7, “Physical Climate Processes and Feedbacks,” of the Intergovernmental Panel on Climate Change’s Third Assessment Report on climate change. 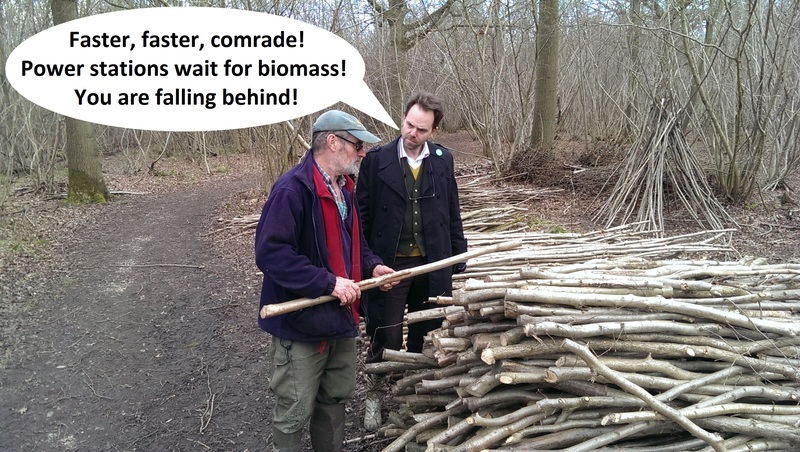 Censorship and Intimidation in Climate Science. Former Obama Energy Department Undersecretary Steven Koonin on how bureaucrats spin scientific data. As a fundamental research scientist, with a lot of faith in the peer review system, I found all of this very troubling to say the least. And the more I pulled on each thread, the more and more the CAGW hypothesis began to unravel. I am at the point now where I have withdrawn from educating students about CAGW. Until all of the above can be explained and accounted for, I feel it is simply immoral to educate future generations about a topic I myself cannot understand. I can teach spectroscopy and quantum mechanics with little problem, however CAGW is beyond my capability. I wish you the best of luck on whatever journey you are on… but after an exhaustive review of the CAGW literature and IPCC reports, I am out. Good quality graphs of full-length tide gauge records from high-quality tide stations are absolutely essential for “grounding” the reader’s understanding of sea level, in particular the (lack of) response (thus far) in rate of SLR to GHG forcings… The omission of such graphs appears calculated to hide the fact that, thus far, sea level rise has not increased in response to GHG forcings, and will surely be powerful ammunition for critics of the IPCC and its reports. I used to think it was a moral obligation to teach CAGW, but now I believe it is unethical. Professor, there are things even worse than plague in Siberia. 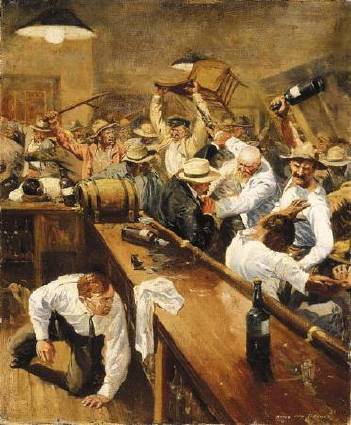 Global warming will kill 4.5 billion people and the rest of us will spend our days in violent fights over beer shortage. And our women will grow gills, webbed fingers and toes to hunt and gather under water. That can only lead to the destruction of the patriarchal world order. 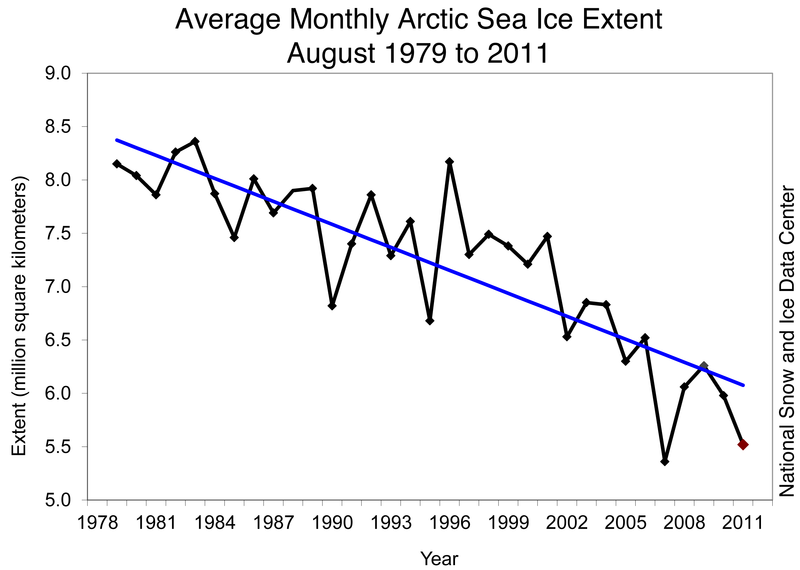 You want longer period of Arctic sea ice. 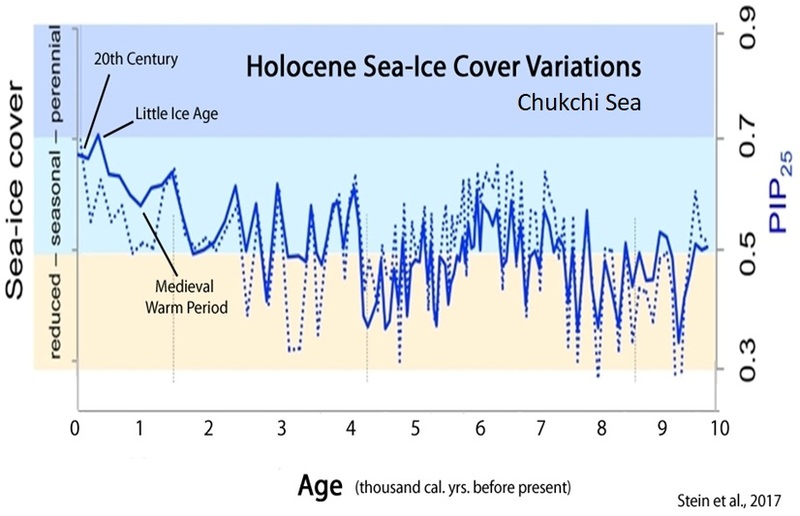 How about this one showing that the current level is actually within the top 10% of the last 10,000 years, and only just a small amount down from the extremes of the little ice age. If you pretend to be a Prof. then you should allow yourself to be SO IGNORANT. !! NSIDC Arctic extent just jumped above that of 2000. Revealing tree stumps. You do know many of those glaciers didn’t exist before the LIA cold anomaly, don’t you? And this is a bad thing.. HOW? What have you got against plant life? How did those bugs get there? Must have been when it was MUCH warmer, hey. Coral reefs have been around for millions of years , they survived the Holocene Optimum. Bleaching is a natural occurrence, and in the case of the recent GBR bleaching, was due to the El Nino causing a drop in water levels exposing the upper surface of the reef to more sun than it was used to, and still currents not providing food.. It is now rapidly recovering. For a so-called Prof.. you seem to be particularly IGNORANT. Nope. He doesn’t know about stumps under the ice, and doesn’t care to know that glaciers aren’t permanent, nor that they have grown and receded throughout the millenia. Because the climate was perfect in 1968, and so any deviation from that must be bad. If CO2 produces stronger, hardier plants, that is bad news. They produce oxygen, which humans breathe. We must wipe out at least half the human species on earth, in order to protect life on earth. Not to that ignorant troll. He clearly believes permafrost is permanent… and that man caused the warmth in this natural cycle. His mind is made up, and despite his disingenuous claim at the end of his rant, he has no interest in being convinced otherwise. spike55 says: “Coral reefs have been around for millions of years , they survived the Holocene Optimum. Bleaching is a natural occurrence, and in the case of the recent GBR bleaching, was due to the El Nino causing a drop in water levels exposing the upper surface of the reef to more sun than it was used to, and still currents not providing food.. It is now rapidly recovering. It is by choice. He doesn’t care to hear about recovering reefs, or about natural cycles. He’s been told CO2’s magical powers are stronger than and will override natural cycles – although EVERY CAGW projection has failed. The drive-by idiot believes his religious leaders who have lied to him time and again. They have convinced him that a dubious, unproven hypothesis is settled science. It is warmer than it was in the 1970s; they claim CO2 caused it and that we’re at a dangerous tipping point. So that settles it. No amount of empirical data will change that closed mind. Yes, exactly. Very few people, scientists included, care enough about the truth to examine ideas with which they currently disagree. For most of us, it is psychologically painful to do so. I have to give a sincere tip of the hat to Anon who has commented above. He is a rare bird who has done something incredibly difficult and unusual; he has re-examined his beliefs. I tip my hat to Anon, also. He and I are kindred spirits. I am guilty of giving Al Gore’s “An Inconvenient Truth” DVDs to family and friends, and thusly being influential in helping to solidify their beliefs today. Like Anon, I ignorantly, sincerely led ignorant sheep astray. Later on, I became disillusioned. Thus, my moniker. After my disillusionment (that was powerful), I tried tirelessly for years – as Anon is doing now – to try and help associates understand why found out I was wrong. That is when I realized, you can’t just show a believer dissenting data. A religious believer must WANT to know the truth beyond all preconceived notions and beyond any/all political and social popularity concerns. OR, they will not become disillusioned. IOW, it IS all about CHOICE. Thanks for recognizing and honoring our friend Anon. I have found out (disappointingly) that people like Anon – and myself – are indeed the rare exceptions. What we may lack in conversions, we more than make up for in retention. I have never heard of a skeptic who turned believer. There have been false claims of this, like Muller, but not one example that I can find. Once the truth takes hold, it doesn’t let go. It is by choice. Prof Stev likes to wake up in his bed and believe what he wants to believe. It is more comfortable that way. Heck, even was in one of those anti-CO2 human signs on the beach, once. Then I did some research, and I laugh at my past non-thinking gullibility. Where man does not go , use pesticides or where coral is protected ( 5% of the world’s coral) it is growing like a forest in pristine condition- see Bikini Atoll Coral or Coral around Cuba. Well that is unless you think climate change has the ability to miss out where man does not go, where coral is protected or where pesticides are not used. If you go back and read Tony’s past posts and the irrefutable evidence from unaltered data that he has documented, you would get lots of convincing. But you seem like someone that has already made up your mind, so I seriously doubt that you would have the intellectual curiosity to make that effort. Don’t be silly Andy, Stev doesn’t have the capacity to make up his own mind. Somebody else made it up for him. Bet he needs rubber sheets or Depends to keep from staining his mattress. It is a very obvious cherry pick to go back 37 years to start your chart. If you went back 10 years you get a totally different picture and if you went back 80 years you would get a totally different impression. Those impressions would not show significant warming. Where do you think 6 feet of sea level went in the past 6k years. Hint, Arctic sea ice was much lower to non-existent back then when it was actually warmer. We’ve been cooling for at least 8-10kya. DMI Sea Ice Volume update for Nov 23: Volume now 14,531 cu km, up 117 cu km from the prior day. Growth was 106.40% of the 16-year average growth. Current volume is 99.06% of the 16-year average, ranked #8, and 98.52% of the DMI-charted 10-year reference period 2004-2013. I teach Earth and Space Science. My classes debate the whole glad bal warming issue from all sides. This site has been invaluable as a resource. I teach Earth and Space Science. My classes debate the whole global warming issue from all sides. This site has been invaluable as a resource. The Trust said that man-made climate change was one area where too much weight had been given to unqualified critics. 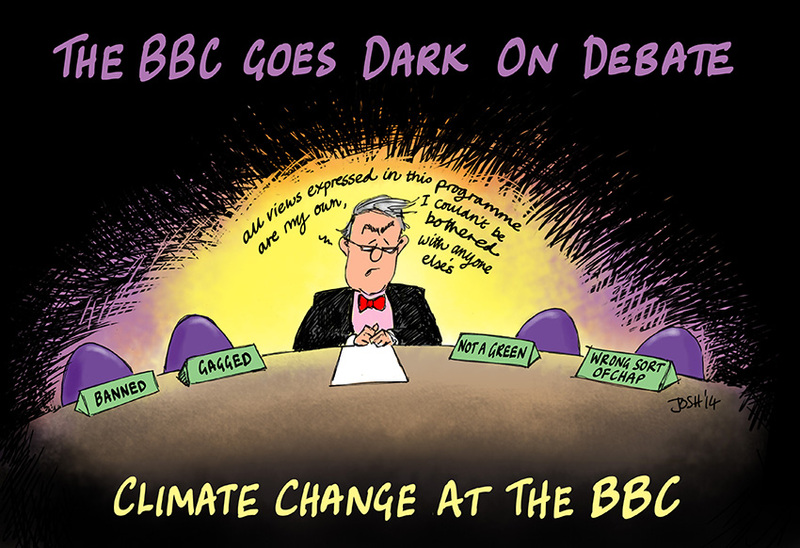 In April the BBC was accused of misleading viewers about climate change and creating ‘false balance’ by allowing unqualified sceptics to have too much air-time. We know that only governmental climate scientists must be allowed to speak to the masses. No, no, he won’t go!